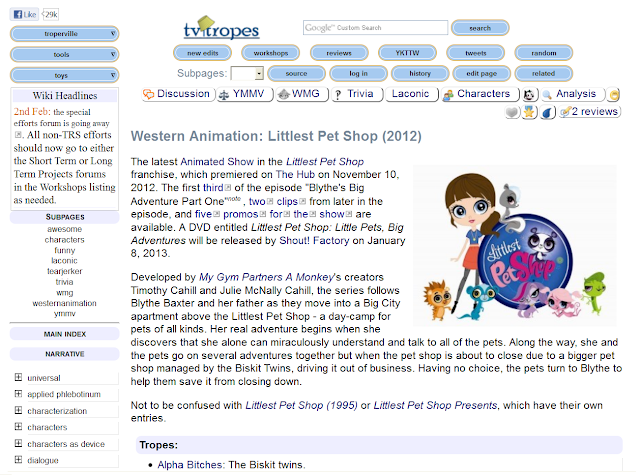 Turns out that LPS has its own tvtropes page*, and someone/some people have been updating it diligently, even up until last Saturday's episode! There's a lot of cool stuff to read there! Learn about how every character except Blythe is a "Cloudcuckoolander", or how many Shout Outs the show has made in the first 14 episodes alone, or why Vinnie is the Not Like Any of the Other Pets, or how many characters have had Unstoppable Rage, plus much more! *If you're unfamiliar with tvtropes.org: Tropes are devices and conventions that a writer can reasonably rely on as being present in the audience members' minds and expectations. They're not cliché, they're ideas that pop up in all types of media and art, and even in real life. I'm one of the contributors to that page. Yay! Good ol' Tropers, cataloging whatever's popular enough to get a page. The more popular something is, the more complete and accurate its Wikipedia, TV Tropes, and IMDb pages will be.